Exhibiting your business at a trade show is one of the best ways of generating a buzz, making new contacts and creating brand awareness as well as name recognition. The importance of these events cannot be overstated. 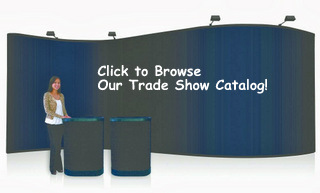 Attending with the right trade show graphics is therefore of paramount importance. Some exhibitors make the mistake of taking the same tired old displays that they had when they first started out. In some cases, these displays may still feature an outdated logo color hue, mention a product that has been a staple of the lineup for a decade now or tout a new service that has become commonplace. Do not be among them! Putting your best foot forward in an exhibit hall calls for innovative materials that are as visually stunning as they are provocative and engaging. Choose to display your company name, logo and images of products that you are exhibiting. These can be huge colorful images that span the back of your trade show booth or they can be somewhat smaller and fit onto portable banner stand displays. Then there are the customized tabletop displays that let you set the tone for different display opportunities within your booth area. Should you stick with the venue-owned table covers? You do not have to if you choose Spotlight Signs and Imaging Solutions for your customized table throws. We imprint covers, runners and skirts with your logo, company name or product image. Ceiling banners are also a nice touch. They capitalize on a space that many exhibitors overlook. 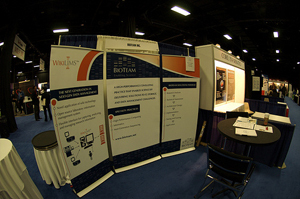 When you display your company name and logo above your booth, it is easy to find you – even for attendees who are on the other side of the hall! Another great opportunity for bringing your trade show graphics into play are the high-tech displays that are slowly catching on. There are iPad holders, interactive presentation stands and portable truss systems with occasional white screens for projections. Adding moving presentations to still photos and graphics is a great way of getting attention and creating a bit of a buzz within the area of your booth. The friendly experts at Spotlight Signs are ready to serve you. 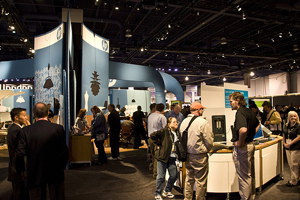 We help businesses in and around Chandler, Mesa, Phoenix, Gilbert and Tempe with the setup of attention-grabbing trade show displays. Whether you need help putting together a display area from scratch, want to switch out some outmoded components or want to add to an already existing setup, we can help you make the presentation look harmonious and professional. Contact us today for a free quote!